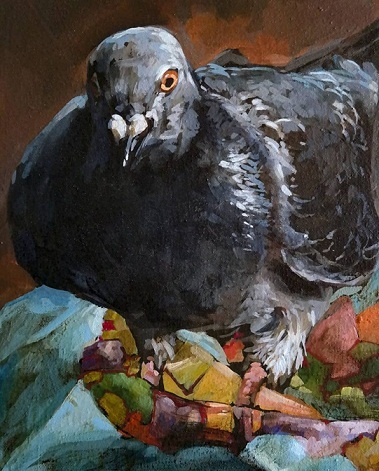 An exhibition by Grace Kotze titled Spoils of a Creative Forage will open at the KZNSA Gallery on October 10, 2018. This exhibition tells the story of Kotze's present creative meanderings as she moves through her visual and emotional surrounds. Kotze's exhibitions usually consist of a very limited subject base through which she explores her concerns. 'But at present my mind is like an over-active mouse, scurrying through an overstocked pantry gathering delicious visuals. Hence “Spoils Of A Creative Forage” is full of a myriad of subjects that are held together by an emotional pull. 'At present I am very conscious of humanities attachment to objects through emotional bonds formed by family stories, memories of past experiences and associations. These objects become almost like a talisman that hold some greater power than inanimate objects. “As do coveted artworks which mesmerise and move the viewers, taking on a mystic value, painting replicas of master’s works is a way of learning, paying homage and adding emotional content to my work through the poetry of another’s. I have so much to learn and I am so grateful for the abundance of artwork to be seen and learnt from. It’s inevitable that some of these creations are absorbed into my work. “Interwoven with these themes are the creatures of Durban who bring suggested movement into the genre of the still life. As much as I love still lives, adding a subject that moves always allows me to exhale during the creative and viewing process. All the birds and animals that I paint are ones that I have stalked and photographed in Durban. This gives me a deeper understanding and compassion for the manner in which they have to navigate their way around the city.